This entry was posted in 1920s, Comics, Movies. Bookmark the permalink. I think you’re wrong about people not being able to call Mickey Mouse by his well-recognized name. Corporations have a choice between registering copyrights or trademarks or patents. They don’t get to assert all of them, or more than one, all at once. 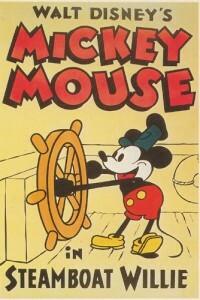 The initial claim of intellectual property is in the copyright for Mickey Mouse, not a trademark. If he’d been invented and trademarked all at once, we’d all be screwed. But he wasn’t. They pursued some claims for particular examples of his image and possibly particular examples of his name designed in certain particular ways later on. Mickey Mouse of course is probably already in the public domain and always has been because of the well-known imperfections in the initial copyright claim. But even granting Disney the current copyright term that supposedly adheres to Mickey Mouse, when he’s in the public domain, he’s in the public domain and he can be called by his name. If they’ve trademarked terms like “Mickey Mouse Socks” or “Mickey Mouse Cowabunga Adventure Ride,” then, no, you can’t use those particular terms, his name was his name from early on, and I don’t think they tried to do any trademarks with it until the mid-30s, after the fact. You should get some expert analysis by people like the lawyers who have determined that he’s in the public domain already. Anyone who says that Mickey Mouse is in the public domain is – by definition – not an expert.